Hello, it's Day 7 in my countdown. It is exactly one week before the Gala Preview at Hampton Court Flower Show. Can't get off that rollercoaster now! It does seem strange to be writing again so soon, so will just fill you in about progress today. Picked up some knitted teacosies first thing from a lovely lady who lives in our village who has been kindly making some up for us. Then on to my mums who after a quick call to this morning said she would look after my 6 year old small person who threw up all over the landing last night! Poor little love. She woke up this morning full of beans as if nothing had happenened, but could obviously not go to school (just in case). She packed her colouring things, glue and scissors and was delighted to have nanny all to herself. I then went on to the studio. 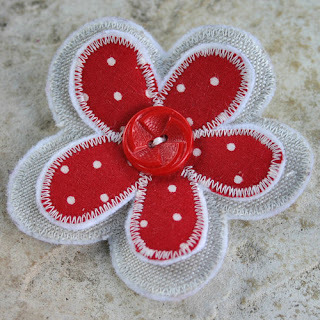 Today i wanted to sew up some more flower brooches, many of which i had prepared some time ago. 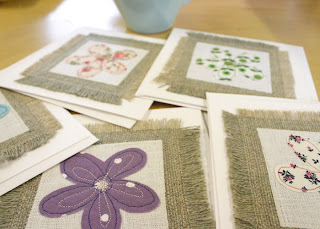 They are all different and each one is individually designed, from fabric combination to thread stitch colour through to final button finishing touch. I try and vary them as much as possible so most people can find a colour combination they like. So some are wacky and retro, some pretty and tonal and some simple and natural... and lots more in between. Me and my summer brooch. I have 3 in different colours. Alice has been finishing handbags today made by recycling various collected fabrics and giving them an Alice twist. Will try and photograph for you to see before the end of the week. We will only have a few but they really are special and we feel very original. A case of the fabric leading the design. Our young friend A popped in today too and helped me prep some more flower cards. A was one of our work experience students from a local secondary school last Summer. She is extremely talented and has a fantastic confidence with colour. She has just left school and is awaiting her results. We work with a scheme called Trident who organise work experience placements for year 10 pupils. We had 2 girls last year and are due another mid July. A very worthwhile thing to do and our way of giving something back to our local community. See you on day 6.
darling brooch! 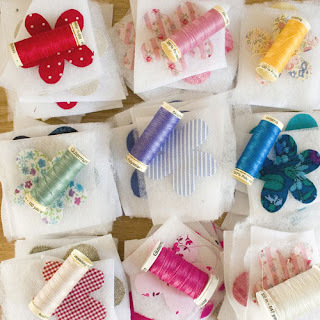 and.. love the picture of the threads so much! Everything looks beautiful. I've said it before I know, but you're going to be very successful! 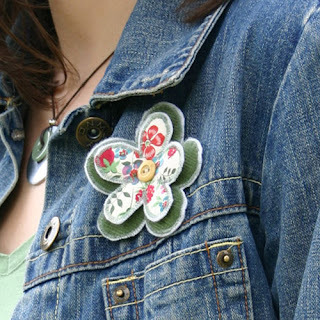 The brooches are too stinkin' cute! Maybe trying one of those will break me out of my crafting slump. What would we do without mothers eh? I hope your little person is fit and well again. I'm looking forward to the pics of Alice's bags - I am a great fan of fabric s you know! Thanks for all the supportive comments... really appreciated. yep mothers are amazing.. Alice and i are both very lucky with ours. They are so easy to wear arn't they.. glad you love yours. We are in the process of creating a secure buy now kind of website, so will put on the brooches and other stock soon.. We are aiming for the 15th July. Was on your blog earlier.. enjoy your holiday.